Beautifully presented, Popburgers are different, because they look so perfect. When you get your pop burgers, they looks exactly like its picture. They taste wonderful, too. It’s thought of as one of the best gourmet burger joints in NYC. Opening times: Sun-Wed: 11am-2am Thu: 11am-4am Fri-Sat: 11am-5am Lounge Sun-Wed: 5pm-2am Thu: 5pm-4am Fri-Sat: 5pm-5am. 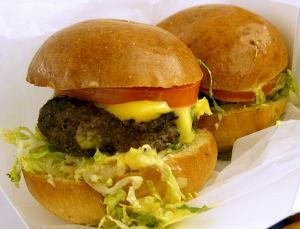 Price level (only burger): $9.25 (£5.95) for two small burgers. The two dainty burgers and fries are delicious and picturesque. Pop Burgers and French fries with a “special pop sauce” is what NY.co.uk would recommend. The stylish burger lounge was created by famed restaurateur Roy Liebenthal. The interior is retro-art style. Yes, Pop Burgers offers delivery within New York city. Any alternative burger restaurants in NYC? Whitmans burgers are priced about the same and are also worth a visit. If you want to experience a classic place, try Shake Shack burgers or The Burger Garage.